At the beginning of 1915 there appeared the prototype Curtiss Model R, which was in 1935 given the retrospective designation Model 2, an enlarged version of the Model N with equal-span staggered wings. The prototype with highly-staggered, equal-span wings and with single long cockpit for pilot and observer. Powered by 160 hp (119 kW) Curtiss V-X engine. It was flown both as a land-plane and float seaplane. Pilot and observer of this military reconnaissance biplane were housed in one long open cockpit and the Model R could be distinguished from the Model N by its inter-plane ailerons and lack of a fixed fin. The initial production military utility series version were designated as R-2 introduced unequal-span wings with ailerons attached to the upper wing, a vertical tailplane which incorporated a fixed fin and horn-balanced rudder and there were separate and widely spaced cockpits for the two crew members. The Curtiss V-X engine of the prototype was retained. The R-2 went into production at the end of 1915 and was built in some numbers, 12 going to the US Army (AS64-75), making only limited use of the type. The US Army R-2s were flown in support of the expedition against the Mexican insurgent leader Pancho Villa, but although their serviceability was poor they flew a number of reconnaissance and liaison missions. One hundred were built for the Royal Navy Air Service. The one-off R-2A was an equal-span variant and established an American domestic altitude record of 2740m, carrying pilot and three passengers, in August 1915. 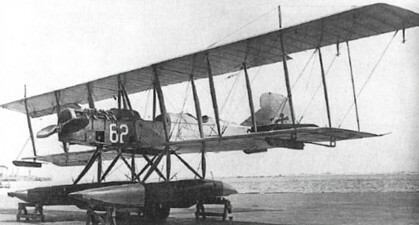 Two R-3 seaplanes, resembling the R-2 but with increased wing span, were brought by the US Navy in 1916. The R-3 of 1917 was a USN reconnaissance twin-float development of the Model R with three-bay wings. Two were built as R-3, A66 and A67, and 11 or transfers to the Army, also as landplane, but somehow came off the assembly line as R-9s (AS33748, AS39033-39042). The R-4 (Model 2) of 1917 were an Army ambulance version of the R-2. Fifty-five were converted (AS177-192, AS281-316, AS469, AS2157, and AS37923), plus 12 new-build with a 400hp Liberty 12 as R-4L (AS39362-39367, AS39954-39959). They were refitted with 360hp Liberty 12 engines (de-rated ex-USN motor) as R-4LM. One R-6 Mailplane is recorded as transferred from military surplus for evaluation in air mail service, powered with a Curtiss V-2-3, 200hp. The Model R-4LM were conversion of R-4L into mailplane for the US Army, with the front cockpit converted to a mail compartment with capacity for 400 lb (181 kg) of mail. Many were used after WW1 in air mail service. The Model 2 / R-6 were two-seat floatplane with long-span wings of R-3 but powered with Curtiss V-2-3 engine. Seventy-six (A162-197) were delivered to the US Navy plus twenty (A302-341, AS504-521, AS68563-68564) floatplanes and landplanes for US Army. They were used for torpedo-bomber trials post war. Forty R-6 (A302-341) were converted to the Model 2 / R-6L with a 360 hp (269 kW) Liberty L-12 engine, plus 122 (A873-994) were built new in 1918. The Model 2A / R-9 of 1917 was a two-seat bomber version of the R-6 for the US Navy, similar to the R-6, but with crew positions reversed so pilot sat in front cockpit and observer in rear. 112 built for the US Navy, ten of which (A883-887, A901-905) transferred to US Army in 1918 (as AS39033-39042).